Patti Penn, Founder - Pause in JOY! There is a point in your life when you realize what you thought someone else was going to fix, was actually your calling. At three years old I witnessed the devastation of my grandfather’s passing to my tight-knit Glasgow family that didn’t take death well. The intense grief ricocheted through my mother’s entire skeleton, contorting her hands, spine and feet as the young twenty-three year old she was, was now diagnosed and trapped in that diagnosis as severe rheumatoid arthritis. To me it was crystal clear at three years of age the cause that spread through her entire body and what traumatic emotions detonated the dis-ease – but no one was allowed to speak of him, not yet. My family were really good at ignoring their emotions, pretending everything was fine as the bingo always helped create the theater of distraction and ignoring the daily symptoms. Thirty years later a tumor the size of a bowling ball and my father’s severe clinical depression was to come head to head. My father went into a tailspin thinking my mother was going to die as he had been silently battling his own hopelessness and unresolved emotions from childhood trauma for years, but now he couldn’t cope. I landed back in Glasgow with a thud from year of being away and allowing them just to get on with it but I could no longer let it fly, we were going to have to go there. I watched Western medicine treat the physical but ignore emotional sobbing of his soul, his hopeless in life choices and his torment of not seeing a way out. You don’t think it matters until it manifests into matter and now it mattered a lot. As I said I thought someone else was going to solve this problem but that was supposed to be me; willful ignorance was now not an option as I went between the ICU and the men’s psychiatric ward he had voluntarily signed himself into. It struck me, how full the ward was of young men not being able to cope with life, with loss and with themselves. My father and I had a favorite film growing up, One Flew Over the Cockoo’s nest, it wasn’t that funny anymore when you are in it. I was done watching this horror treating the physical dis-ease, tranquilizing past pain with heavy medication and pretending everything was fine, it was time to be all-in. My main focus was to begin with Reiki to take the pressure from my father’s head and keep my own sanity during the process but I knew I didn’t need it to be from the spiritual divine light teachers I had met over the years. No, I needed someone that spoke the language of the medical model, I needed someone with an knowledge of what I was dealing with. I had two Reiki Masters to meet, one our schedules never quite connected and then I met Christine Ross (Glasgow). Christine was a new Reiki Master, not someone with years of experience but she worked at the Beatson Cancer Hospital for thirty years in the radiography department and my intuition peaked. The moment she laid hands on me, I knew, there was no divine white light but an incredible bout of laughter that pulsed through my entire body and hers as treated me – laughter was not part of my life at this juncture. To me it was all aligning for me, she brought laughter into my life where there was none and she worked at the Beatson. Studying with Christine over the years she suggested I learn Emotional Freedom Technique, I was clear it was enough with the invisible energy but that tapping thing was a no-no. Obviously my own unwillingness was steeped in insecurities and fears of people not getting it, or getting me anymore. But I trusted my teacher as she told me she ‘knew” I needed to learn it so I unwillingly agreed to participate as my father’s severe clinical depression and my mother’s cancer eclipsed my embarrassment. What others thought of me was irrelevant as the two people I treasured the most needed me to dig them out of their abyss of pain, hopelessness and emotional graveyard. Being on this journey with them was the most raw moments of my life from colostomy bags, four deaths, depression fighting institutions to pull them both out of a quicksand of despair. Their journey taught me a lot about that sweetspot of encouraging, backing off, leaving someone alone to pushing and I thank them for that. Both my parents are practicing students at level two in the Pause in Joy path finding new ways to remember their joy and injoy each moment giving thanks. But as fate would have it America called me back a second time, this time to Los Angeles that I didn’t quite understand but took the call. 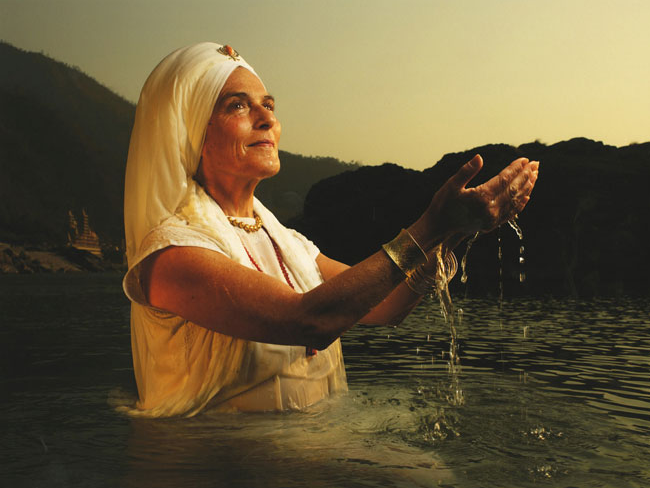 Landing in Los Angeles knowing no one really in this world of healing, I am eternally grateful to Gurmukh Kh alsa, the Queen of Kundalini. I had a meeting with her events director that she crashed and grilled me over two hours asking about the reiki and EFT. She was not about to endorse just anyone for her pregnant mothers at Golden Bridge and she was quite right, she looked at me dead in the eye and said do you know what this means – I had no idea but I knew by her tone it was huge. The following week Gurumkh was on the front cover of Vanity Fair as The Queen of Kundalini 2007 and I thank her for her personal endorsement as it meant everything at that time. Her blessing opened doors where there were no doors. Over the years my wee Reiki books and EFT sprouted into a philosphy that went from Pause to Pause in Joy in 2008. Hundreds of students and thousands of sessions, work with veterans at Serve the Warrior in 2010 was to bringing me to the notice of the Heal Documentary. Kelly Noonan Gores knew she wanted someone that had worked with veterans doing the tapping thing and they called one afternoon. I had been asked to be part of reality shows and documentary’s over the years and declined but when I spoke to Kelly and Adam the producer I knew their intention was aligned with my own. I was tremendously honored to be part of this documentary and collaborating with Michael Mollura, composer of Heal with spoken word New Way Meditation. Future projects will be bringing you more meditations, vlog Waling Each other Home, and some books published over the Summer. Thank you to everyone who has supported Heal from screenings to sharing with friends and family, I appreciate your enthusiasm in spreading the Heal message.